Periods 1,3,5: We reviewed systems and are finishing the 12 systems from class. Period 6: You got the practice test for simplifying radicals. Watch the following on how to solve systems where the variables do not quite cancel each other out. I do #5 and #8 from the worksheet from yesterday. You are responsible for doing 4 more. Watch the following videos. Take notes. The first two go with Notes Simplifying Radicals and the first worksheet. The second goes with the worksheet with the fractions. Periods 1,3,5: Finish solving the systems of equations by graphing them and finding the point where they are the same. Periods 1,3,5: We worked on the "Function Machine" project and turned it in today, Tuesday. Period 6: We did prodigygame.com. There are assignments, that you complete just by paying the game. We are using this as review for the SBAC test in a couple of months. You will all be taking the GRADE LEVEL test, not the Integrated 1 test. Periods 1,3,5: we started the Function Machine mini project. DUE 2/14. See below for a link to the guidelines and a sample I drew 1st period. We will work on it in class Monday and Tuesday. Do what you think you need to at home to make yourself successful turning in the project on Wednesday. Period 6: We took the exponents test. No homework. Period 5: Function machine worksheet. Period 6; Practice questions, reviewing exponents. Test on Friday, 24 questions, multiple choice. Period 6: Scientific Notation Worksheet. 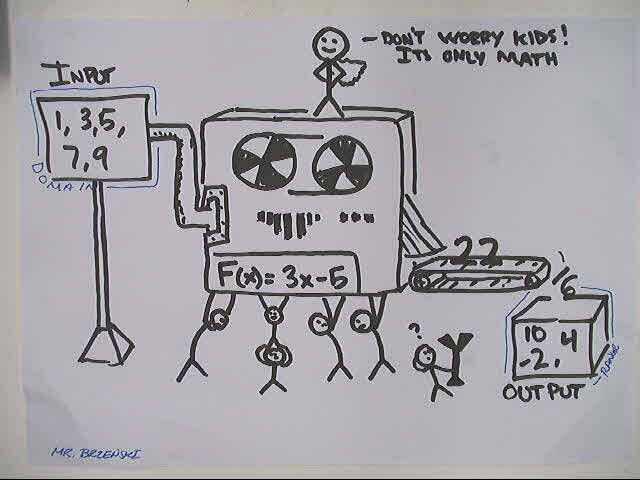 Period 1,3: Review functions with "Function Machines" - Robot page. Period 1,3,5: Finish drawing graphs for the back of the function page. We did a couple in class, see below. Period 6: we went over the scientific notation page, and turned in homework from last week. I will write down final scores on Wednesday, and put them in the grade book. Periods 1,3,5: Finish graphing the functions from Wednesdays homework. Due next Monday. There are 4 assignments this week, 16 total points possible for the first homework set. Period 6: Take four of the constants from the pages below. Write them out in standard notation, and give a short explanation of what they are. See attached files, with Plancks' Constant worked out for you. The mass of the Earth, how much matter the Earth takes up in kilograms, or if you balanced an Earth on a scale, how many kilograms would balance with it. 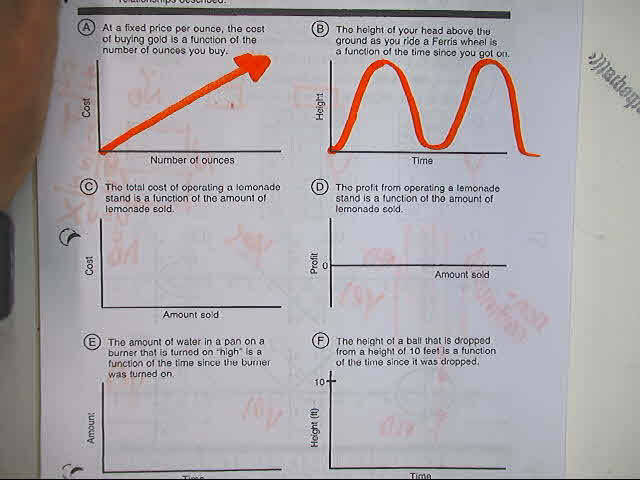 Period 1,3,5: Finish matching the functions with the pictures, "Going backwards" worksheet. Period 6: Page 77, simplifying fractions with exponents. Periods 1,3,5: Finish the patterns sheet that has no pictures. Same thing, just without the pictures. Period 6: Two sided worksheet on exponent rules. Bring page 400 tomorrow also so we can go over it.